41g Protein; 1g Fat; 16g Carbohydrate; 0g Fibre. Place the marinade ingredients in a saucepan. Stir and heat gently until the sugar has dissolved. Set aside to cool. Place the steaks in a shallow dish and pour over the marinade. Cover and leave in a cool place for 30 minutes. Preheat the grill and cook the steaks for 5-6 minutes, turning once and basting with any remaining marinade. 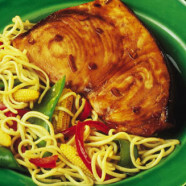 Serve with stir-fry vegetables and noodles.